The success of the girl's soccer team at Camarillo High School may be overshadowed by an ongoing controversy. Some players say there's abusive and bullying behavior, not by opponents or fans, but by their coach. "She called one of my good friends, who's on the Junior Varsity team a 'skank,'" said Lauren Bevan, a former player for the team. Veteran Head Coach Christine Lawler is at the center of an insurrection, which she says is being blown out of proportion. At least six of her players, two of whom are senior captains, have either quit, or been kicked off the team. "A coach should motivate, which is true," said Hailee Wooff, a former player. "But they shouldn't absolutely smush players' self-esteem and self respect. It got to a point where it was affecting my school as well as my family life." Some player's parents say they've witnessed behavior that crosses the line. "I know the difference between a tough coach, and a coach that degrades and humiliates," said parent Sue Swaim. "This has been going on for 13 years and has progressively just escalated," said parent Michele Sprague. 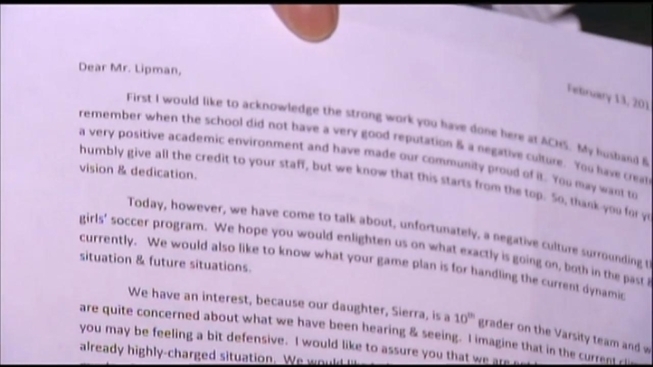 Several parents put their concerns in writing, and then met with Camarillo's principal, Glenn Lipman. But the parents and students say nothing really came from the meetings. Lawler says the dissenters have gripes about playing time and her coaching tactics. She told The Ventura Star that parents and players "don't agree with my coaching tactics," adding "if you don't practice you don't play. And if you are hurt, you don't play. Not everyone agrees with that." With little direct action by school administrators, and Lawler still at the helm, some stars say they won't join the team next year. "It was never comments that would bring your self esteem up," said Jessica Valdez, a Junior at Camarillo High School. "Instead it would bring you down." Some parents say its time the coach got the boot. Despite the dispute, the players say they'll be at Camarillo High School's upcoming playoff game to cheer for their teammates. But they'll have a real feeling of conflict, because they'd rather be on the field.